Writer? Check. Actor? Check. Blogger? Check. Podcaster? Check. Mom? Heck, yes. Momtrepreneur Katie Schorr has quite the resume. Together with her writer-actor husband Lance Rubin (who just wrote a book, no big deal), the two make a serious power couple. Add into the mix their adorable 15-month-old son Sly, and you've got quite the trio. We met by total chance while on "vacation" in Florida. Seated next to each other at the pool-side snack bar, I noticed Avery making eyes at the most adorable little boy. The two were clearly around the same age, and as parents we all gave each other the knowing "aw, so cute - and we're friggin' exhausted" smile and nod. Our families got to talking and discovered that we lived within walking distance of each other in Brooklyn. Also, Sly and Avery had the exact same due date - what were the chances? (Feb 5th, 2014, in case anyone was wondering). How interesting to know another baby who is the same gestational age as Avery, and another mom who is the same age as me. Although Sly was born on Feb 1st, and Avery impatiently decided to arrive about a month early on January 10th, it's amazing how many similarities the two have developmentally. It's so fun to watch them play together and for Katie and I to gush (and commiserate!) about the joys, challenges and anxieties of motherhood. More about that on Katie's hilariously honest blog O Mother Where Art Thou? If you haven't already, I advise that you immediately download Tumblr and follow "schorrthing". Be prepared to laugh, cry, and cringe along with Katie. And if you're me, basically feel as if she has transcended into your brain, reading your innermost thoughts. If you are a part-time stay-at-home-mom, as Katie and I sorta consider as one of our many titles, things can get mundane and lonely in no time. Playdates are as much for the mamas as the babes, and we're not afraid to admit it! If you're ever at the playground and you feel creepy because you're wavering about asking another nice mom for her digits, just bite the bullet and do it. Chances are, she's thinking the same thing. Nothin' wrong with picking a mommy up at the park, the neighborhood coffee shop or your Music Together class. Seriously, if there's one thing I've learned about motherhood and just life in general, it's that I know nothing and there is so much out there to learn. The best way is to learn from your peers. Oh, and podcasts. Podcasts are your second best friends and mentors. And lucky you! You too can now be podcast besties with Katie by listening to her awesome new "momcast" with friend Cody Lindquist on "What do we do Now?" Avery and Sly had a playdate yesterday. They crawled and toddled around consuming excessive amounts of cheese and cheddar bunnies, performed a proper concert with maracas and castanets and conversed deeply about Elmo. While Avery was relentlessly banging on the refrigerator and Sly was chucking around UK copies of his daddy's book, I managed to sneak into Sly's adorable room and snap these pictures. I mean, how Pinter-Etsy can you get? 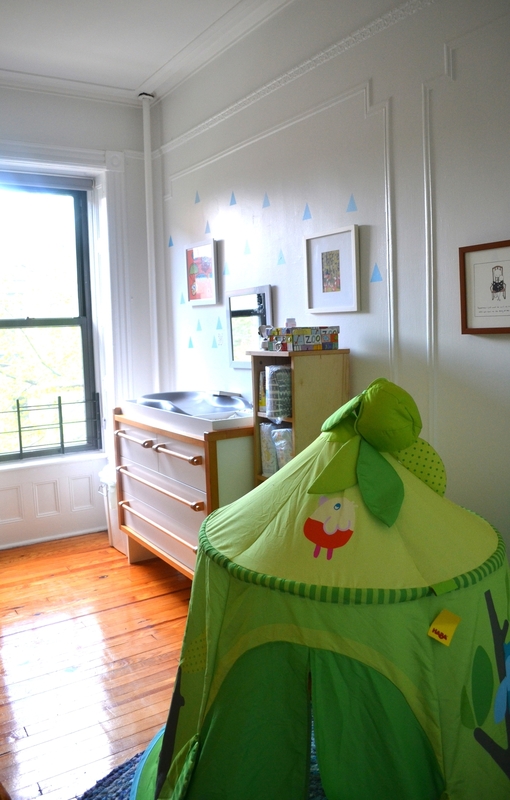 I love this bright and airy nursery. Right down to the clean white walls, the colorful decals and the vintage orange chair accented with a playful robot pillow. But what really wins me over here is the whimsical artwork. Oh, and of course the mini teepee tent! The monsters picture is by the artist Inocente, who starred in the self-titled documentary which won the Acadamy Award for Best Documentary Short Subject in 2013. This was a D.I.Y. with a card from Paper Source + a West Elm Frame! Yep, it's official. Sly's nursery is almost as cute as he is. Almost. You can follow Katie on Twitter @katerschorr and Pinterest here. Stay tuned for a fun upcoming style board collaboration!